This delicious fried snack is my favourite one. I learnt this recipe from my friend's Mom when we visited our friend during our college days. She served us with a very tasty coconut chutney. This is a fulfilling snack when served with a cup of hot coffee or tea. 1.Heat oil in a pan. Splutter mustard and cumin seeds. Add chopped onions and saute till onion turns golden brown. 2. Add Coriander, salt, red chilly powder, turmeric powder, garam masala and mashed potato. 3. Mix well. Close the pan with lid. 4. Cook on medium flame. 5. After 10 minutes. Remove from stove. cool and then make balls. 6. Prepare batter by combining besan, salt, ginger-garlic paste, red chilly powder, turmeric powder and a little quantity of water. Add more water if needed. Batter should be of Idly batter consistency. 6. Roll balls over the batter and deep fry in oil. Yummy,one of my family favourite. It's raining here. Love to have this rite now with a cup of tea. Looks crispy and tasty. 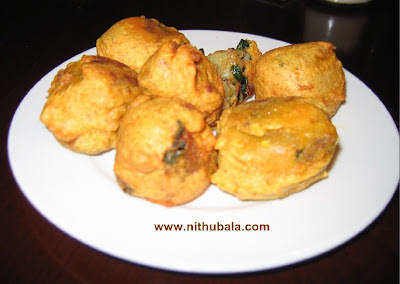 Very delicious and crisp bondas. just love it. Great snack.. Perfect with evening tea..
Aloo bonda i love! Especially with tea! Omg, wat an incredible bondas, drooling here. My favourite snack too. You make I will eat:D! First time here Nithu....yummy bondas...wow you won so many prizes. congrats... Happy to follow you.